These photos were actually taken yesterday, but I’ve fed everyone this morning, and will do it again (with Anna’s help) this afternoon. 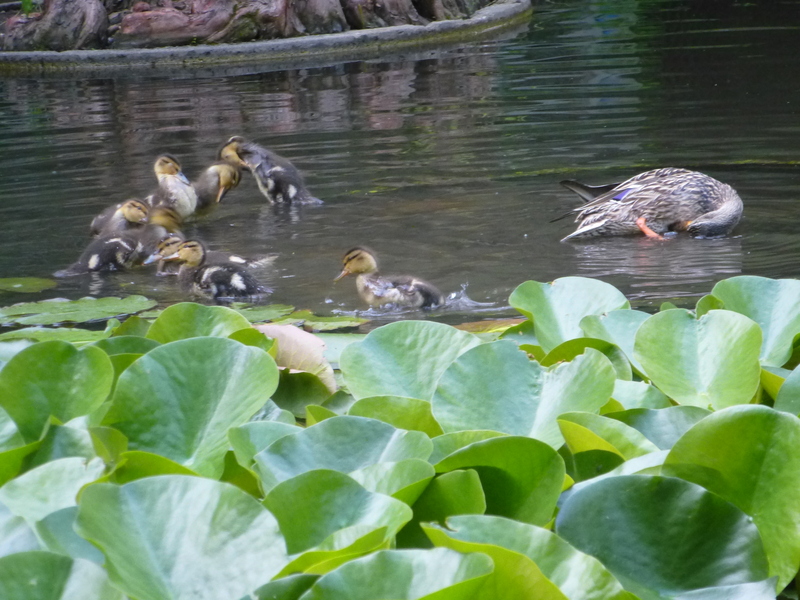 As you can see below, and it’s still true, all eight ducklings are still around and in good shape. Frank and Henry are around, too, and Frank’s been a pretty good duck (Henry gets chased out of the pond by Honey, but I make sure he gets some corn). I’ve discovered that if I don’t whistle for the ducks, and if I creep up on the pond silently when Sir Francis isn’t around, I can feed the family until he finally cottons on to the fact that I’m there with food. 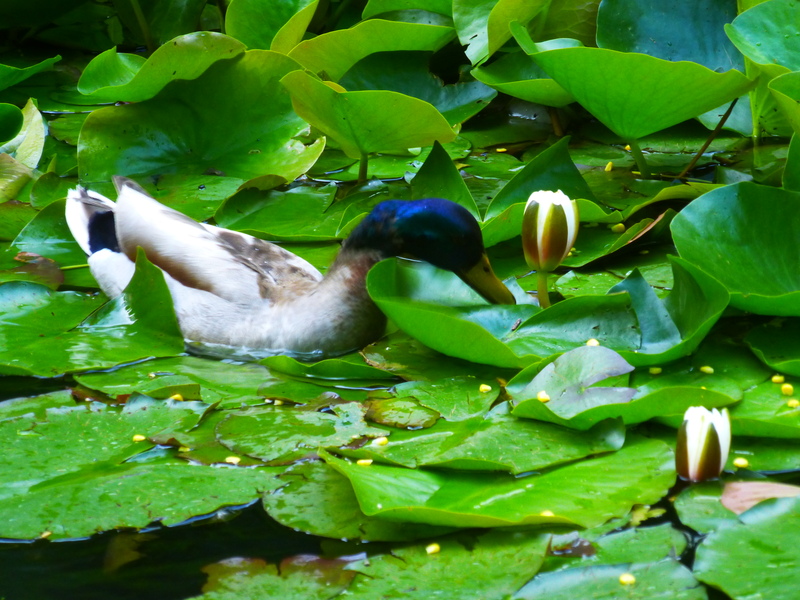 Sometimes I can distract him by feeding him corn on the lawn or the lily pads, enabling the family to get down a good amount of food. I have ordered a Super Soaker water cannon if I need to drive him away. He chases the ducklings all the time, though he doesn’t hurt them. Sadly, the video feature of my point-and-shoot camera seems to have crapped out. I wanted to take a movie yesterday, as bathtime was a real trip, with all the ducklings cavorting, splashing, and grooming in their tub. One might even think they were having fun! This entry was written by whyevolutionistrue and posted on June 6, 2018 at 1:30 pm and filed under ducklings, ducks. Bookmark the permalink. Follow any comments here with the RSS feed for this post. Both comments and trackbacks are currently closed. It looks to me like you have all your ducks in a row. Really needed that one. They are growing sooo fast!!! I actually don’t notice them growing. I can see it if I look back at old pictures, but looking at them just on one day, they pretty much seem to be the same size they always were! 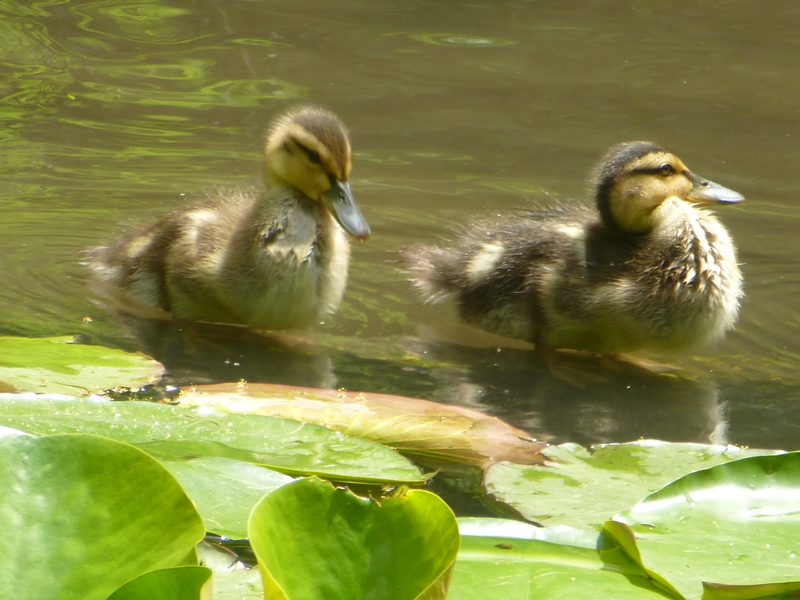 I hope you won’t be too shocked to see the ducklings fledge in about 50 days, and reach their mature weight in about 12 to 14 weeks! The thought is staggering to me. Indeed, I’m surprised by their changes in your daily posts. The sooner they fledge the happier I’ll be, as I am anxious to see them grow up healthy and fly. I have been following these Guys .from Egg to Young Eagles and the speed with which they get to this point is absolutely amazing,they will fledge any day now. 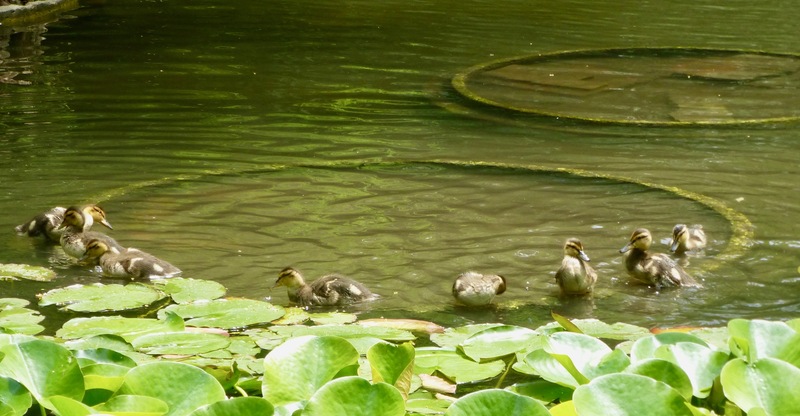 Can you tell which of the kids (is there a collective for child-ducks? Brood? Clutch?) might be male or female yet? A touch of color, or something, somewhere? Oh, do you really want to know that. Hear of a chicken sexer? Don’t know if it works the same on the ducks but probably does. Involves a squeezing and a bump. There are several names for groups of ducks though I didn’find any specifically for ducklings. I like a paddling of ducks even if its only supposed to be used when they are in water. O/w brood or clutch will do. They can;t be ananymous forever. Maybe Jack, Kack, Lack, Mack, Nack, Ouack, Pack, and Quack? In response to comment 4. The photo of Honey quacking is nice. Wonder what she’s telling her little fuzzy ones? I think you need to work on your deducktion skills. One of the consequences of dabbling in photography, I guess. 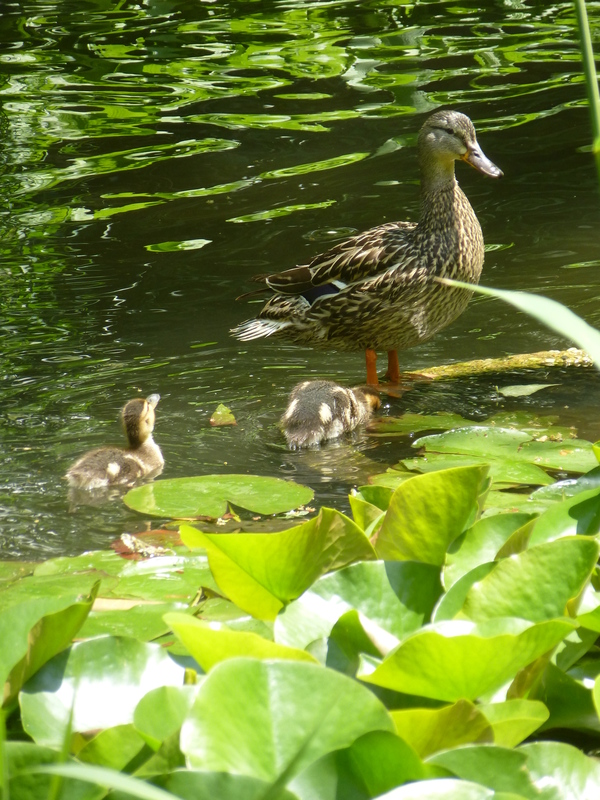 The ducklings have grown so much! They still have those white “eyespot” markings on their backs – wonder if they act as any sort of deterrent? That’s so cool! Last summer I helped raise a family of Ravens…I was hoping they’d be back this year but so far no show. Thanks for taking care of the ducklings! Won’t the Super Soaker’s stream just be “water off a duck’s back” as the saying goes? Such things do work well with cats. That much is certain. If I lived near you we could put bands on their legs (special bird banding permit required). That way you could tell if they’re the same birds. Maybe a reader close to you is a bander or knows of one. We band birds in our backyard and had the same male cardinal for 7 years!! 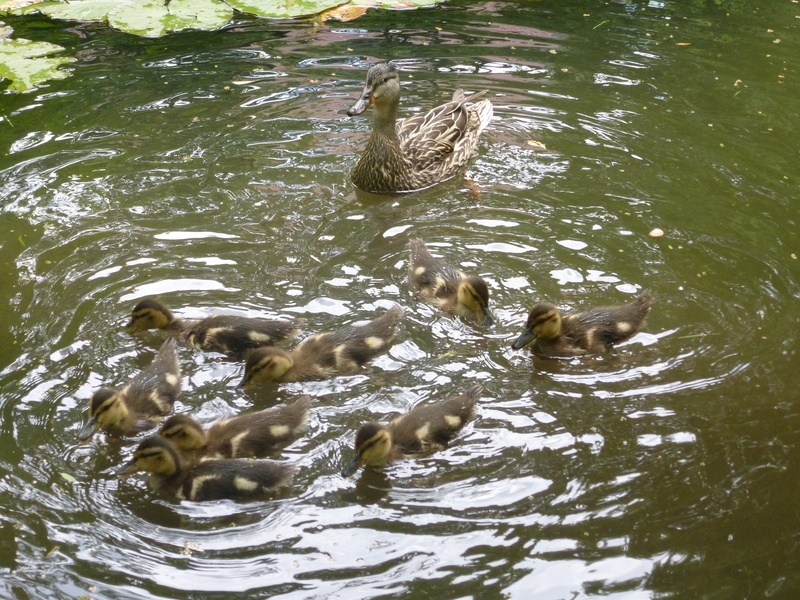 But Johnson’s opinion is scarcely the final word and the therapeutic value of ducklings is disputed by authors. However, 80 years later, Thomas Hardy, clearly a confused non-biologist, was inspired and encouraged by a duckling thrush. 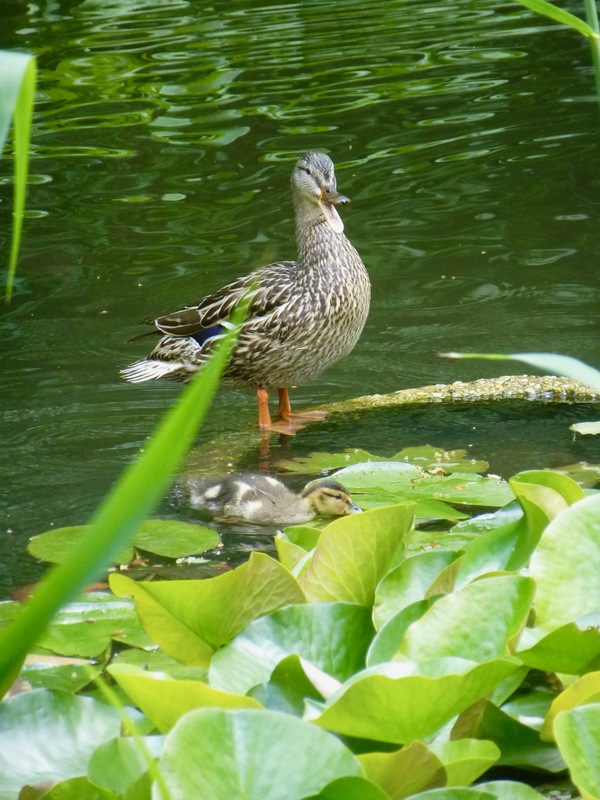 Have you given a thought to how many ducks you may be feeding next year? I don’t think it will increase. 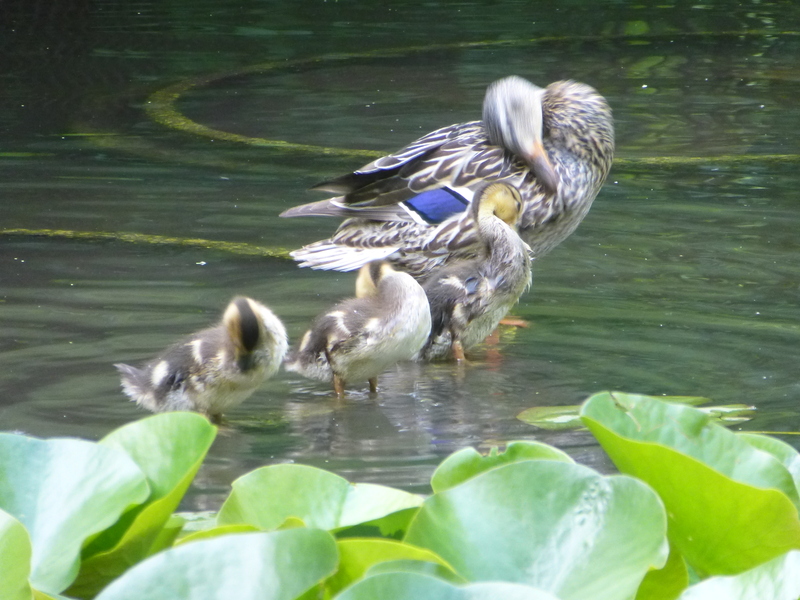 Last year Honey raised four ducks, but she was the only one who returned (granted, she had one hen and three drakes). I imagine the ducks will sort themselves out, birds, perhaps after a bit of fuss, tend to work out amongst themselves what the required living space is. I’d bet that the pond can never get overcrowded due to instinctual “personal bubbles”, if you will. 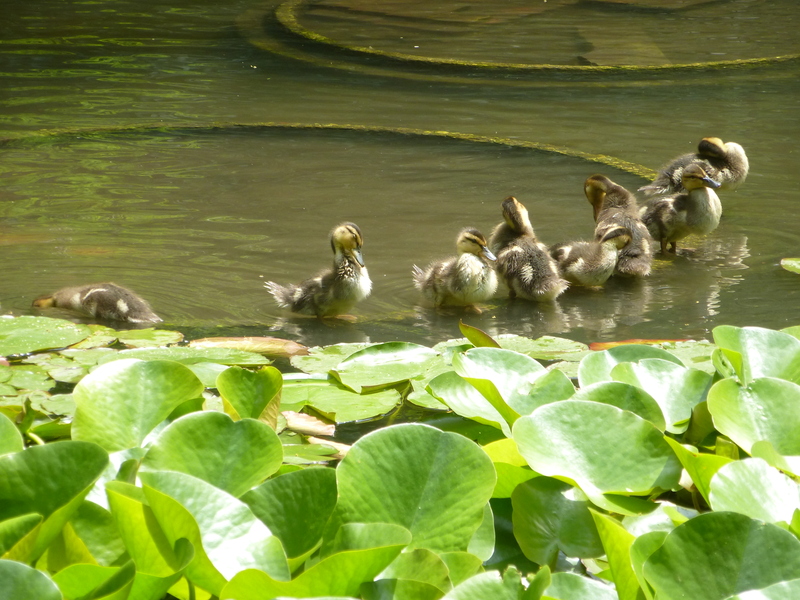 One cannot grow tired of ducklings, as they don’t stay ducklings for long. 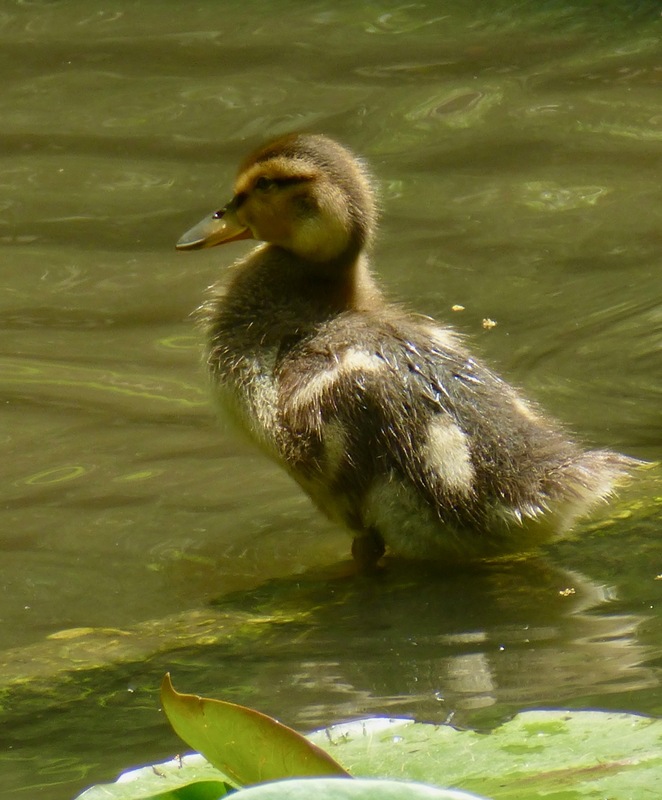 One can, however, grow tired of seeing duckling pictures…for one would rather be seeing them in the flesh, or, well, in the fluff. I do wish I could spend some quality time with the little buggers. If you are tired of the pictures, simply skip these posts. Any chance of setting up a “Honeycam” we can all log on to?